The Prime Minister who addressed twin rallies in Thakurnagar at North 24 parganas and industrial zone at Durgapur took a swipe at the TMC and particularly at its supremo Mamata Banerjee for her “misrule in Bengal”. Prime Minister Narendra Modi on Saturday came out all guns blazing against the Opposition Congress and ruling Trinamool Congress (TMC) in West Bengal highlighting host of issues like syndicate raj, loan waiver, chit funds and paintings to drive home the point that he was fighting against corruption and black money while seeking a second term for his BJP-led government. 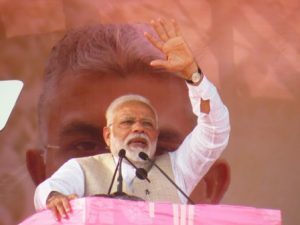 PM Modi who addressed twin rallies in Thakurnagar at North 24 parganas and industrial zone at Durgapur took a swipe at the TMC and particularly at its supremo Mamata Banerjee for her “misrule in Bengal”. He even coined a new term TTT or Trinamool Tolabaazi Tax (Trinamool extortion tax) for the ruling party. “Didi kuch galat kiya nahi hai to itna darne ki zaroorat nahi hai. Kis baat ka darr lag raha hai? (Didi, If you are not in the wrong, why are you even scared?). The ruling party has introduced TTT in almost every sector and education hasn’t been spared either. Even students have to pay TTT for getting admissions in educational institutions. She has killed the aspirations of the middle class. These things cannot continue forever,” Modi said while kick-starting the BJP campaign for the upcoming General Elections in West Bengal. Alluding to the United India Alliance rally held by TMC on January 19 as a desperate attempt by a section of frustrated and corrupt leaders, he said that the arch rivals have joined hands for his ouster. “They are cursing me because I am against corruption and hording of black money. People (read as political leaders who attended the TMC brigade rally) who were not ready to see the face of each other have joined hands and have taken a vow to defeat me. Fear was clearly palpable on their faces,” he said. The PM also accused the West Bengal Chief Minister for halting development projects in West Bengal. “She fears that people will support Modi if the development pro schemes of the Centre becomes successful in the state. Look at Ayushman Bharat health scheme which has been withdrawn by the state government because people were getting cured from it but it didn’t go down with her. She began to spend sleepless nights over the success of the scheme and decided to pull out,” he said. She had alleged that PM Modi took undue credit for a project, 40 per cent of which, the West Bengal government was funding in the state. 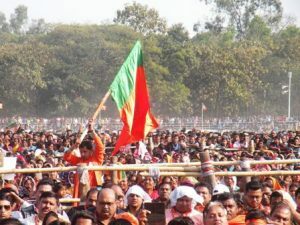 Several thousands of saffron party supporters had began to throng the rally ground since morning and the ground was packed by the time the PM arrived after attending an “apolitical” event organised by Matua Mahasangha at Thakurnagar off Bangaon in North 24 parganas. The PM praised the interim budget tabled yesterday in the Parliament and hailed the PM Kisan Samman Nidhi scheme announced by his government as an unprecedented step taken post Independence. Through this scheme, the Union government will provide direct annual income support of Rs 6,000 per annum to farmers with land holding below two hectares. The welfare package is likely to benefit around 12 crore farmers and would cost the exchequer Rs. 75,000 crore. “The Congress had given loan waiver of Rs. 52,000 crore during their rule while the present government would provide 7.50 lakh crore to farmers in the next 10 years. Parties have been playing politics by offering loan waiver to farmers and this was again displayed during the Assembly polls held recently. Cops were chasing farmers who have failed to repay loans by the Karnataka government and the Bengal government is supporting the move,” he said drawing applause from the crowd. Attacking the Congress, he said only those who never took any loan got waivers. Citing the example of a farmer from Madhya Pradesh who only got Rs 13 after he applied for a loan waiver, he said that the cash transfer scheme is much superior as it will be completely transparent. He also tried to hit the TMC where it hurts the most: The syndicate raj and paintings of Mamata Banerjee allegedly purchased in crores by chit fund owners. Earlier during the day, the PM arrived at Matua Thakurbari in Thakurnagar and sought the blessings of Baro Ma, the current leader of the Matua community and widow of the founder of Matua Mahasangh Harishchandra Thakur. Soon after, he addressed the rally and raised the issue of Citizenship (Amendment) Bill in Thakurnagar, which is the hub of the sizeable Matua community, who originally hail from erstwhile East Pakistan and began migrating to West Bengal at the beginning of the 1950s mostly due to religious persecution. The rally venue was near the house of Matua matriarch Binapani Debi. But he had to cut short his address following a stampede-like-situation in which some BJP supporters including women sustained injuries. Matuas with an estimated population of 30 lakh in West Bengal have influence in at least five Lok Sabha seats in North and South 24 Parganas districts. The BJP state unit was hopeful that PM Modi will speak on the Citizenship Bill at Thakurnagar in the circumstances, party sources said adding that the BJP-aligned faction of All India Matua Mahasangha is organising the rally. Sporadic clashes were reported between TMC and BJP supporters following the PM’s rally. Hours later, the Chief Minister gave a point-to-point rebuttal of the salvos hurled by Modi. While referring to the Godhra riots of 2002, she said that his hands are smeared with the blood of the innocent people. “He should be ashamed of himself as he is not fit to be a Prime Minister. He has blood of innocent people on his hands. He should think about his government rather than worrying about Bengal as his government has already past its expiry date. Union Home Minister Rajnath Singh also addressed two rallies at Cooch Behar and Alipurduar in North Bengal where he said that the Centre will use technology to seal the international borders with Bangladesh in West Bengal and Assam through an integrated border management system. More rallies by the senior BJP leaders have been lined up in the coming days.